All music and performing arts extracurricular programs are administered by a sister company of UniKids Inc., the Unik Music & Arts Studio (UMAS) . Unik is a talented organization of Grammy Voting Members, powered by KeySound Records professional audio engineers and producers and world-class voice trainers with a minimum of a Master's Degree, Berklee College of Music graduates, and dance teachers with international stage experience. Let our passionate and inspired staff of artists help inspire your child and build a foundation for his or her artistic expression. 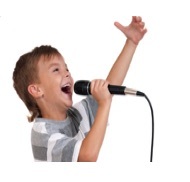 Professional Vocal Coaching for Stage, Screen, Auditions and Studio Recording. Lessons are taught by world class voice trainers with a minimum of a Master's Degree level of education, who help students discover individuality as a performer and their own vocal style. Learn from the Berklee College of Music graduates, Grammy Voting Members, and professional Audio Engineers and Producers. The class is taught by professional dance teachers with international stage experience. Your child will learn body language, movement technique, different dance styles, facial expressions, and stage presentation. Singing, dancing & acting. Our Broadway Theater Program is one of our most unique classes. Students get a taste of life of a Broadway actor through professional acting and voice lessons that culminates in a show-stopping performance.